This amazing trip is open to current 5th Graders (2016-17 school year). Typically, this community trip occurs every other summer and is one that always proves to be exciting for the most recent 5th grade graduates. Depending on interest and size, often it can also be opened up to past Brandon students or current 4th grade students. Both of these teachers have taken up to 10 families on this trip for the past several years during the summer after 5th grade graduation from Brandon. Please email Madame Darlis if you are interested in attending or learning more about the trip. Invitation is open to all Brandon 5th graders on a first-come, first-served basis until all spots are full. This trip is designed, planned, and has been led by Brandon French teachers for the past 20 years specifically for graduating Brandon 5th graders and at least one parent/guardian/other adult (siblings depending on ages, parent(s), and/or grandparents). As an IB tradition, all Brandon 5th grade students will be assigned a pen pal from the school École Fracasse in Deauville, France (located in the Normandy region of France) beginning in Fall 2016. Brandon 5th graders will send letters and pictures and communicate with their pen pals throughout the school year. 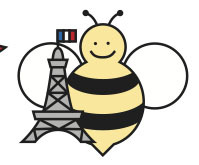 Students that are able to join the summer trip to France will meet their pen pals in person, and have the opportunity to spend two nights at their pen pals’ home as well as attend a day of classes with them during the trip. There are over 50 alumni families that have participated and are willing to be references for this life changing experience and incredible learning opportunity. This trip is designed for Brandon students to use their acquired French skills by exploring another culture along with their teachers and family. The estimated cost per person is $3500-$4000, depending on the exchange rate, the number of participants, and airfare. An ideal number of participants is typically 25-30 (students and parents). A minimum number of participants is 10 students with at least one adult with each student plus 2 teachers, for a minimum total of 22. Your spot will be reserved with a deposit of $500 per person. A family information meeting will occur in mid August at the Brandon Main Campus Media Center at 6pm, Date TBD. Jennifer Rosenfeld (jenhrosenfeld@gmail.com) will be the Brandon parent liaison for the 2017 trip.